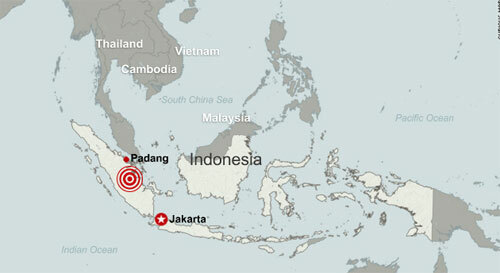 Monday October 25, 2010 – Spasms from within the “Ring of Fire,” a toxic fault line that spurs disasters from the Earth’s deepest layers, sent a destructive earthquake to Indonesia which then resulted in a deadly tsunami and volcanic eruption. The 7.7 earthquake struck just 13 miles below the ocean floor and was followed by 14 heavy aftershocks. Mount Merapi erupted early Tuesday morning, killing so far 18 people and causing thousands to flee the storms of volcanic ash contaminating the air. Off the coast of Sumatra, a 10-foot tsunami struck the Mentawai Islands uprooting entire villages. So far the death toll stands at 113 yet over 500 people are listed as missing. One group of Australian surfers accounts they were anchored in the bay when the tsunami struck and sent their boat straight into a neighboring vessel. They were forced to abandon ship when a fire broke within the cabins and then scrambled into the highest trees for refuge. Follow the CNN blog for updated news about the disasters.